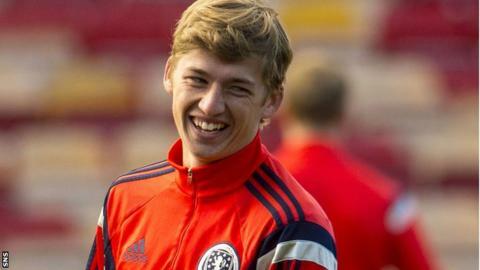 Ryan Gauld believes he and his Scotland Under-21 team-mates can lift the nation's spirits and give Gordon Strachan food for thought for the next senior qualifying campaign. The former Dundee United forward, now with Sporting Clube de Portugal, is considered one of the brightest prospects in Scottish football. As the Scotland Under-21 squad prepare to take on France and Iceland at Pittodrie, Gauld acknowledges the footballing public are in need of a pick-me-up after the A team's failure to reach Euro 2016. "It'd be good to show the country the future's in good hands," said the 19-year-old. Gauld is one of a number of young players who have been brought into the full squad during Strachan's time in charge to allow them to familiarise themselves with the senior set-up and to let Strachan get to know them a little better. Callum Paterson and Lewis Macleod have benefitted from the same experience, as have Stevie May and Stuart Armstrong, who have subsequently been called up again by Strachan as he prepares for the future. "There are a lot of players here with a lot of quality, but we're still young and learning the game," said Gauld. "Obviously Gordon Strachan has shown already he likes to take boys up from the under-21s to train and I think he's been impressed by what's come up. He's shown he wants to blood young guys into it and give them the chance. "Hopefully we can all put on good performances and catch his eye and then hopefully we can reach a stage where we're all playing well enough that he can't not include us. "He spoke to me when I arrived and told me why he's brought me in and to enjoy it. He was great with me and it was a great experience to be around and be able to train with quality players. I took a lot of things from the week or so I was with them." As much as Gauld is keen to make the step up to the senior squad, his current focus is on helping the under-21s reach the 2017 European Championship finals in Poland. Having recorded an opening victory away to Northern Ireland, they play France in Aberdeen on Saturday before another home game against Iceland on Tuesday. "A lot of people will say France are the toughest game in the group, but we believe in the quality we've got here and, if we play well, we've got a good chance," said Gauld. "We're going to have to be on top form to get through this group, but it's something we're capable of. "It's important to try to follow up (the win over) Northern Ireland with a result. "It would be devastating to have these games against France and Iceland and not get results, plus it's our home games, so we've got to make them count." Gauld's own development in Lisbon has perhaps not been quite as quick as Scottish football supporters, desperate for a star on whom to pin their hopes, would have liked. He is yet to establish himself in the first-team squad at Sporting but remains upbeat about the way things are going. "They've reiterated during the (transfer) window they had no desire to put me out on loan," he stressed. "They were really happy with how I'm progressing and the plan they put in place when I arrived was still the same. "Obviously my aim is to go up and play with the A team, but I'm willing to be patient for my chance and I've just got to keep doing what I'm doing and hopefully my chance will come soon."